This is a really interesting question, because the answer is not going to be what you think. 3 digit games, often called Pick 3, have good odds of winning the jackpot. 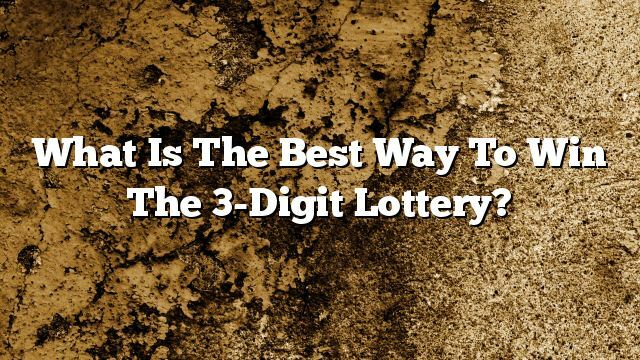 Your odds of getting all 3 digits in the right order are 1-in-1000. That’s because there are 1000 different possible results – from 000 to 999. The issue with these games unfortunately is that you don’t win much when you do get an exact win. It’s only around $250 to $500. Nice, but it’s gone pretty quick ain’t it? But that doesn’t matter you might say – because I don’t need to win every draw, just once a week or so! Surely a good lottery system will give me enough of an edge to make that possible? Won’t it? Realistically? Honestly? NO, it won’t. What about all those people selling pick 3 systems that say they will win consistently? Well, you have to ask why they don’t provide any concrete proof for that. Could it be that they are making money selling pick 3 systems instead I wonder..!? Wait, I can play the same number more than once can’t I? That way I can win twice on the same ticket. Technically yes you can. Reality check – it just means you lose more every time you don’t win. But there is a strategy here to ‘win’ in the 3 digit games. If you want honest reality, the best strategy is to ditch the pick 3 game today and never speak of it again. Instead, switch to a better game. Why? Because your chances of winning a bigger prize once are much better than your chances of winning Pick 3 over and over again! So the best strategy here is to play the game with the bigger jackpot. Don’t go insane and start putting your Pick 3 money into Powerball – go for the 5 digit or 6 digit game in your state. That will pay out a good jackpot prize, and the odds won’t be too bad. I know this will upset a lot of people who love the 3 digit games – but are you playing purely for entertainment? Or are you interested in walking away a winner? Because the only people who ever truly win on Pick 3 are the lottery company.